Take the Pledge and Buy Handmade! I think we’ll all be watching our pennies a little closer this holiday season. There will be some great deals to be had, and for those of us on a tighter budget, it will mean really looking hard to find that perfect gift. So this year, I’ve taken The Handmade Pledge. I’d rather my dollars support an independent artist, artisan, or craftsman, than a corporate machine. The best part about it?…I end up with a truly unique, one-of-a-kind, thoughtful gift, and help an indie artist continue to do what they love. Of course Etsy.com is a great place to start shopping for all things handmade, and they’ve got some really fun ways to navigate the site. Check it out! 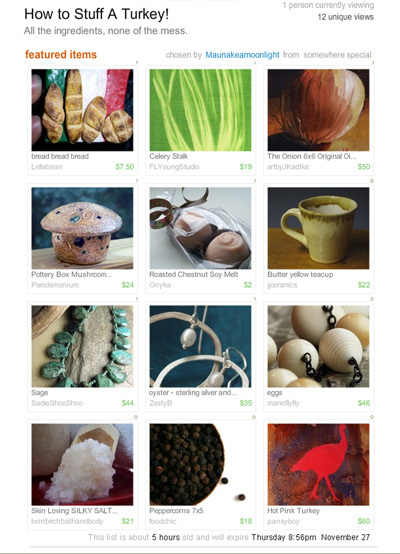 In other handmade news…special thanks to Maunakeamoonlight for including my Celery Stalk print in your Thanksgiving themed Treasury! Want to learn more about the handmade goodies in this treasury? CLICK! I took the pledge, too, and recommend everyone to do so. It’s so gratifying to see the creator’s personality in the product. Congrats on the Turkey Day treasury! I too was facing the issue of how to stretch my gift giving dollars and discovered craft project kits by this company called Foldin’ Money on Amazon.com and the name implies exactly what it is, money folded into designs such as cake, a shirt and a star. The directions were clear and easy to follow. I spent about $45 dollars to purchase the three kits and spent about another $30 in creating the folded money designs. Using fabric and stickers I had around the house, I decorated them in holiday themes for the people on my list. Now my Christmas shopping’s done and I’m excited about giving homemade gifts this year. But the best part is, it’s MONEY that they can spend because the designs unfold and the decorations come off. Hope that helps, Merry Christmas!